Brave enough to re-imagine the world around me. BIO: Bachelor in Systems Engineering. I gained the BA with distinction. Microsoft MVP Data Platform - SQL Server (2015 through July 2018). I am a Certified Database Professional since 2005. MCSE Data Management and Analytics | MCSA SQL2016 DBA/Dev. Have a look at my Microsoft Certification Official Transcript here (Transcript ID: 710696 - Access Code: 71069600). I am a Senior SQL Server Database Administrator (DBA) with over 15+ years of extensive experience managing database servers running on SQL Server 6.5, 7.0, 2000, 2005, 2008, 2008 R2, 2012, 2014, 2016, 2017, and 2019. I have been an International Speaker and Technical Writer of SQL Server Administration tips for over 12+ years; a Contributor and Author at MSSQLTips.com; and the SQL PASS Peru Chapter Leader. I am used to working with all sizes of databases for many multinational companies, most of which are located around the world. 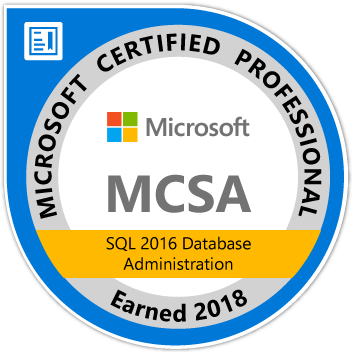 Most importantly, I have an excellent command of all SQL Server Database Administration topics and also I am very passionate about SQL Server Internals. Besides my passion for SQL Server, I am mad keen on Distributed Database Systems, Cryptography, Cryptanalysis, and Data Compression. -Good understanding of Distributed Computing Architectures, e.g. Client/Server, Internet/Intranet. -Good understanding of the underlying Windows Operating Systems 2000/2003/2008/2012/2016/2019. -Excellent teamwork skills. Ability to handle pressure and conflict. I always keep my opinions open. Particularly, I am most comfortable in environments where things are constantly changing and evolving, and personal freedom and achievement are emphasised. Likewise, my approach to work and life is driven by advancement, curiosity and solutions since I am an optimistic thinker who constantly adapts to new expectations. Thinking big, going global, questioning, and being open to change are part of my personality. Basically, I am a down-to-earth man with a great personality and youthful enthusiasm, a bit chatty every so often and happy-go-lucky as well. Above all, I have got principles, and my most important attributes are integrity, honesty and trustworthiness. On the top of that, I am able to laugh at myself and always willing to do my best to achieve all my goals because I strongly believe in the beauty of my dreams. Correspondingly, I have no fear of failure, so I will give anything a go, within reason! Also, I am single-minded and sold on the idea of everything one can achieve depends on our determination and dedication, therefore, "Believe and you will find your way" is my most inspiring quote. In the event that you need more details about my experience please feel free to contact me at any time or you may check out my LinkedIn profile. In the same way, you can also message me if you have any questions about SQL Server or you would like to hire my DBA Services. I can be your 24x7 Remote SQL Server DBA to work anytime from anywhere (reach out to me at sqldba@percyreyes.com). I am looking forward to working with people who are passionate, loyal, honest and spontaneous like you! You can follow me online!